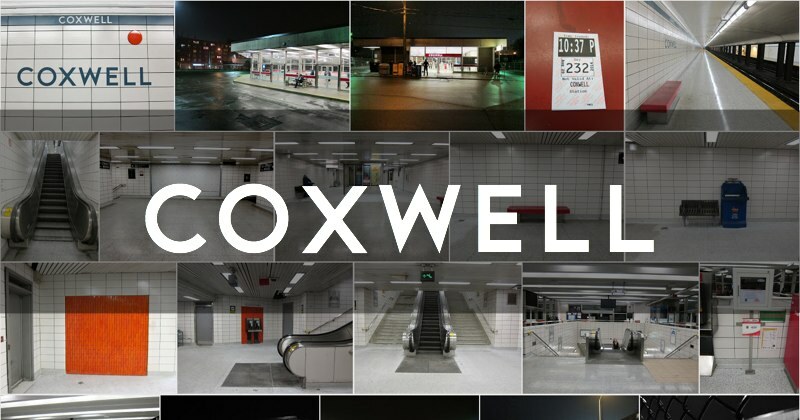 Part of the original Bloor-Danforth line, Coxwell station opened on February 25, 1966. The station’s name alludes to Charles Coxwell Small (1800-64), a clerk in the King’s Bench Division of the Supreme Court. Small owned a large property bounded by Woodbine, Coxwell, and the Danforth, where he raised cattle and operated a tannery and sawmills. For anyone heading eastbound, you’re familiar with Coxwell because of the inevitable ‘short delay while we change crews’ that occurs as train operators end or begin their shifts. The nearby Danforth Garage is used as TTC office space, so a frequent cloud of employees hangs around this station, particularly by the entrance. The form and layout of the compact station are eminently sensible. Platform, concourse, entrance/bus level, each sparely adorned. It may not be beautiful, but it works.